From early childhood it was apparent that young Satya was quite different from his playmates. Although his family ate meat, he himself was a natural vegetarian, who abhorred the thought of killing animals. He was extremely helpful to all in the village, doing work unselfishly, frequently bringing beggars home to be fed by his parents—though they often scolded him for what they felt to be unwarranted generosity on his part. He was called "guru" by his playmates, leading them in devotional songs before school and fascinating and amusing them by taking candy and playthings from an apparently empty bag. Then a mysterious incident occurred when Satyanarayana was thirteen. One day while playing outside, he leaped into the air with a shriek, holding his bare foot. His family feared he had been stung by a scorpion and would not survive. But he slept that night without apparent pain or sickness. Then twenty-four hours later, he fell unconscious and remained so for a day. When he awoke, his behavior was strange, alternating between periods of unconsciousness and what appeared to be trance-like states. He began chanting and quoting long Sanskrit passages of poetry and philosophy far beyond the scope of his formal education. At times he became stiff and appeared to those around him to leave his body, then described distant places which his parents said he had never visited and people whom to their knowledge he had never known. He laughed and cried, explained complicated religious doctrines. Could he be possessed by evil spirits? Satya endured a period of torture as his parents took him to exorcists throughout the countryside. One famous and feared exorcist, to whom the boy's demon had become a personal challenge, shaved Satya's head and cut three crosses into his skull, then poured caustic material into the wound and into his eyes until they were swollen almost shut. Finally, his parents could stand no more of this ordeal and called a stop to it, though their son had apparently not been cured. Baba subsequently stated that he was demonstrating at this time that he is beyond pleasure and pain, beyond duality. He has disclosed that there was in fact no actual scorpion sting: No such bite could create a Satya Sai Baba, and if it could, then scorpions should he objects of the highest veneration and worship. 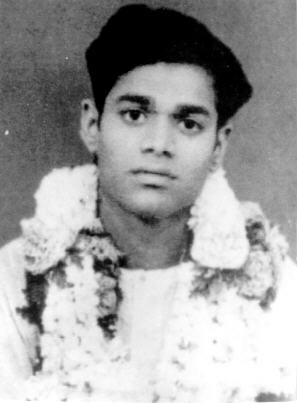 Two months after the supposed sting, in May 1940, Satya's father saw a crowd gathering around his son. He appeared to be manifesting candy and fruit out of thin air, and many people were falling to the ground, calling him an incarnation of God. Confused and frustrated by his son's strange behavior and now by this display of sleight-of-hand or, worse, black magic, Satya's father picked up a stick and approached threateningly. "Who are you... who are you?" he demanded angrily. In a calm but firm voice, the boy announced: I am Sai Baba. Then he proceeded to relate how he had chosen this particular family for his incarnation in answer to the prayers of a devout ancestral sage. He was, he said, the reincarnation of a little-known but much respected Moslem holy man, named Sai Baba of Shirdi, who dressed like a Moslem but wore ash on his forehead like a Hindu. The original Sai Baba had died eight years before Satya was born—the length of time he had reportedly told his devotees would elapse before his reincarnation. Naturally, it was difficult for many in the village to accept this boy, unusual and charming though he was, as the actual reincarnation of a man regarded by his followers as a saint. Young Satyanarayana was beginning to be quite a mystery indeed. Then a couple of months later, on Thursday—Guru Day in India—a group of questioning villagers approached him, pleading, "Show us a sign!" With a quick and unexpected gesture, Satya threw a bunch of jasmine flowers onto the floor. There, it is reported, they clearly spelled out—in Telugu script, the language of the village—"Sai Baba." 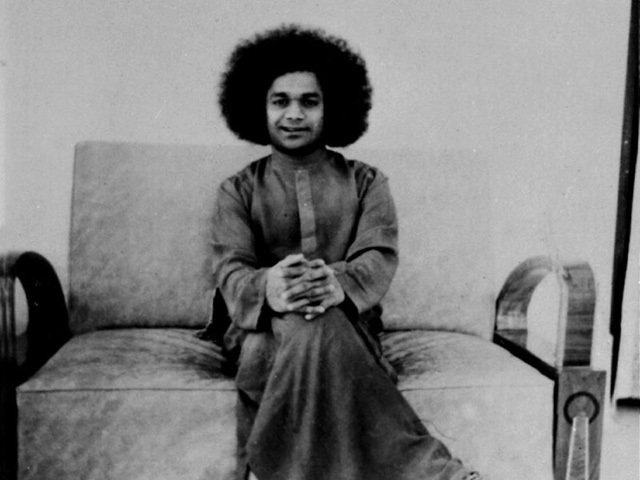 Soon afterwards, Satya Sai Baba told his family that he belonged with them no longer, that his devotees were calling and that he had to leave. He left school in October of his thirteenth year and began to gather followers around him. They grew in number until it became necessary to establish an ashram, where many could live with their guru, and where those seeking his guidance could meet with him. The construction of Prasanthi Nilayam (Abode of Eternal Peace) continues even to the present in an attempt to accommodate Sai Baba's swelling number of devotees. Here and at Brindavan, his summer residence, Baba has received millions of people from India and around the world.